The day of deployment, the barge left shore at 5 a.m. and did not return until midnight. (CCA Florida photo). 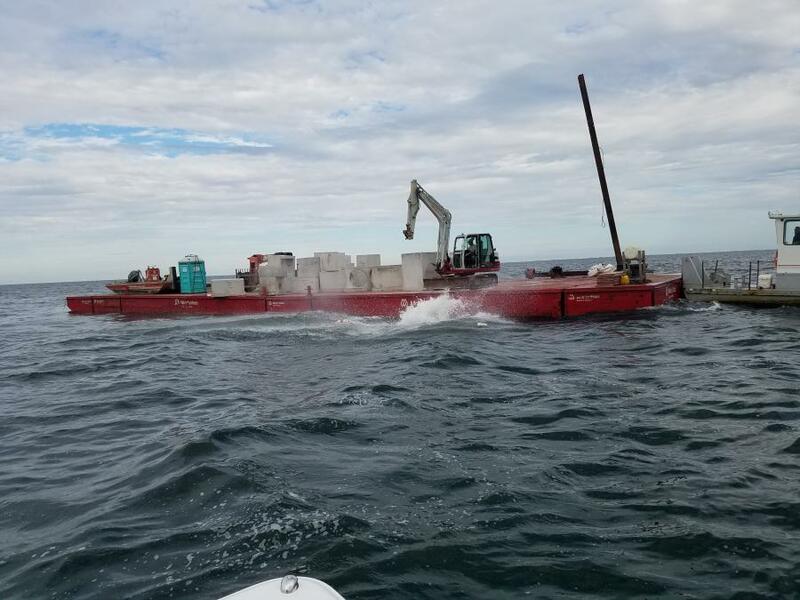 Divers in Florida are monitoring an artificial reef recently installed in the Gulf of Mexico off the coast of Lee and Charlotte counties. The Phoenix Reef, 12 mi. due west of Gasparilla Pass, required more than two years of planning. "When it was finally deployed, the excitement was incredible," said Frank Gidus, director of habitat and environmental restoration for the Coastal Conservation Association (CCA) Florida. "It involved a true community effort, with many people from the local area helping get the project completed, donating funds and providing various services. "The project was designed from the beginning to involve 100 percent local businesses and individuals. 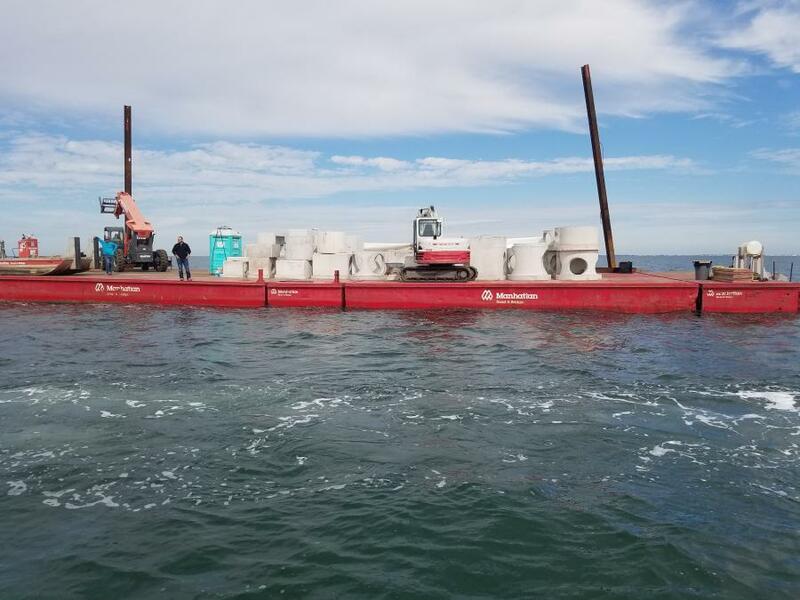 For instance, Manhattan Road and Bridge substantially discounted the cost of the barge and deployment, Coastal Precast donated all of the concrete materials that were deployed on the reef and Ingman Marine assisted with the entire planning process of the reef and provided boat support. This was a huge cost savings for a project like this, where all the funding was raised by the local community on behalf of a non-profit organization, to better their community and help the local economy in the long run." NBC and CBS news crews documented the effort, which was successfully completed in late 2018, in approximately 50 ft. of water on the Phoenix Reef, which lies at 26 degrees 45 minutes north latitude and 82 degrees 28 minutes west longitude. The deployment consisted of high-quality concrete materials, including box culverts and other forms. According to Gidus, keeping tabs on the reef is a key part of the process. "Although monitoring the reef is not a requirement of the U.S. Army Corps permit, Lee County divers will monitor the reef on a regular basis to ensure that no marine debris accumulates on the reef. This would include trash, but also items like fishing line, which can entangle marine life." Gidus said the new artificial reef will be an asset to the local community, to be enjoyed by residents and visitors alike. "The concrete reefing materials will provide much-needed habitat in this transitional area, increased recreational fishing and diving, and will help relieve pressure on other nearby reef sites. The concrete materials were placed on a barren sand bottom, and by doing so, it makes an immediate positive impact and provides instantaneous habitat for many species of fish and marine life. "This reef will create sustainable live bottom habitat where none currently exists and attract and sustain a wide variety of marine life, including fish, shrimp and crab species, for many decades. Because this reef is fairly close to shore, it will also provide easier access to smaller boats, as well as younger individuals, giving the opportunity for more people to enjoy it." Gidus noted that the project will also provide an economic boost for the local area. "Recent studies conservatively estimate that for every dollar spent on artificial reefs, the economic benefit of artificial reef expenditure returns was $138. This is especially important now, as southwest Florida has experienced severe red tide blooms over the last couple of years, and as a result, has impacted the marine life and local economy in a negative way." James Land, Manhattan Road and Bridge senior project manager, said there are numerous concerns when dealing with marine work. "Safety is the biggest challenge. The weather and coordination are always the second biggest, as far as trying to finish jobs to meet schedules and off-load the crane from the barges to prepare the barge configuration to handle the weight of what we're transporting. 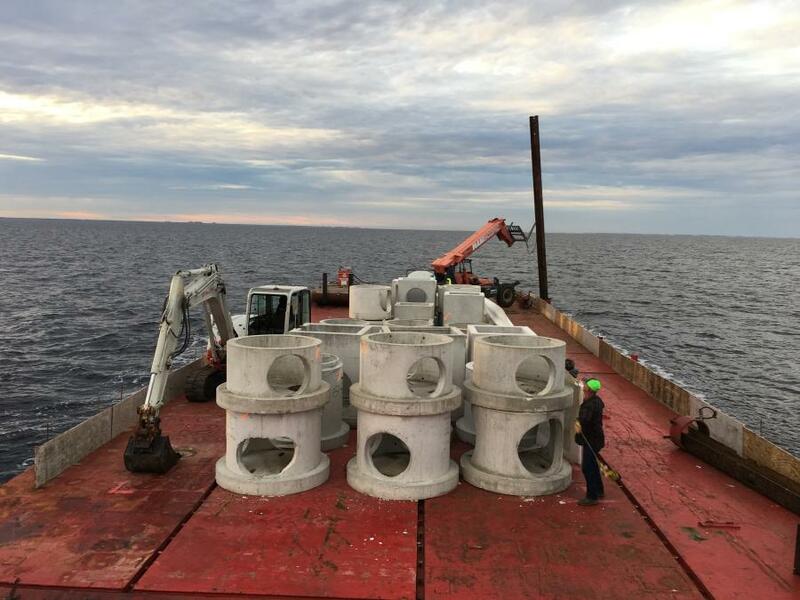 After all the barges are assembled, you then have to coordinate with the shipping company to ship and stage the seven truckloads of concrete structures in different sizes and weights, averaging around 5,000 pounds each, for a total of 125 tons for the first deployment of the Phoenix Reef. "The coordination involved CCA, Lee County and the U.S. Army Corps of Engineers," Land continued. "You have to give written notification two weeks prior to the initial deployment to the U.S. Army Corps, the National Oceanic and Atmospheric Administration and the U.S. Coast Guard. On top of all this, you have to look at past years' weather reports and try to make an educated guess on the dates to give your two-weeks' notice for good weather, because 12 miles offshore can get rough, and you can't reschedule easily or quickly." Fortunately for the team, the elements weren't an issue during the deployment. "If tides are too low, you can't take off from the dock. Wind with high seas can be too rough to travel, but we were lucky," Land said. "If we are out in the wide open water with no cover, and lightning were to hit the barge, it would kill everyone on it, if the water got too rough. Trying to transport heavy equipment or heavy loads, you run the risk of losing some or all of your load, as well as maneuvering the large barge through bridges, which could have a catastrophic outcome for the workers or pedestrians." Land said the reef itself is made up of old drainage structures that would be installed on projects to handle water runoff from roads and parking lots. "We have to keep all deployed structures in a 50-foot area per the permit requirements, so the structures are pushed off with the hope of the stacking on top of one another, becoming a fish condo for all sea wildlife." Manhattan's discussions regarding the project details began with CCA in 2017, in hopes of procuring everything needed for a successful deployment. "With CCA's dedication for marine wildlife and the importance of protecting our ecosystem, and the help of Manhattan Road and Bridge and Lee County, we were able to get the material and get the anchor plan, the boat captain and everything lined up for the deployment in November 2018. 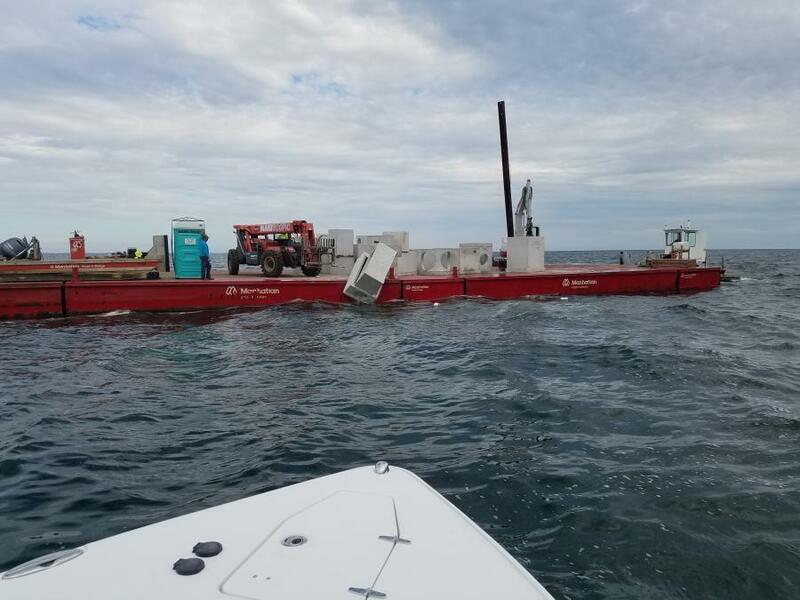 "The day before the deployment, we loaded the barges with 200 tons of concrete structures, a telescoping forklift and an excavator, and moved it to the west side of U.S. 41 bridges in Charlotte Harbor. We left from Peace River/Charlotte Harbor at 5 a.m., and headed west toward Boca Grande Pass. It was approximately 28 miles to Boca Grande Pass, and then 12 miles to the deployment site. We arrived back at the dock at 12 a.m., for a 19-hour day." Land added that transporting concrete and other materials is no small task. "You always want to make sure you have a big enough barge to handle the work you're trying to do, and you have your weight equally distributed throughout the barge," he said. "I want to send everyone home at the end of the day. "We used an excavator to push off the concrete structures and a telescoping forklift to set the spuds in place to help hold the barge in our 50-foot target area. The boat captain stayed in the boat to help steady the barge. There were a total of four people from Manhattan, but many from CCA, Lee County and spectators who came to watch." As for the condition of the site prior to the deployment, "It was a flat, sandy bottom," Land said. "They had to dive the site several times to get approval before we could deploy, to make sure there were no endangered species that could get injured or killed prior to deployment. "Manhattan has done a lot of marine work bridges, boardwalks and docks. This is the first artificial reef we have done. It was a great learning experience, and an amazing opportunity to help our ecosystem and help future generations be able to enjoy the wonderful Florida aquatic system. "It's very rewarding to be involved with our community and county, and to be able to help with all the water quality issues going on, and how our aquatic ecosystem has been affected with all the red tides last year. I enjoy being on the water with my family, and hope this project helps replenish our resources for the future.